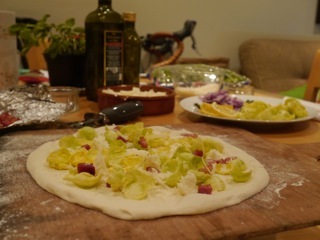 …not from an Ethiopian as in Kipling's version, or in the usual fashion for Neapolitan pizzas but get them he did and we were pretty proud of last night's pizzas. Yesterday was another day of tests, tweaking and perfecting. 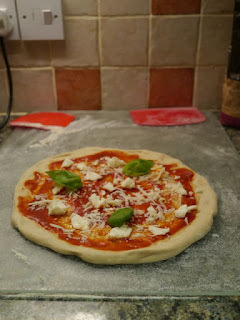 We were using Caputo Tippo 00 flour for the first time, we tried out three different dough hydrations (all with the Franco Manca recipe mentioned in the last post). 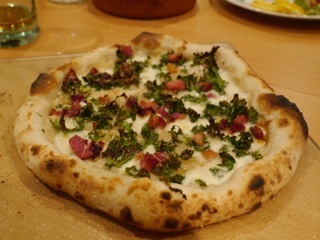 We trialled three new topping recipes, all classics in their own right originating from some of the best places in the US. 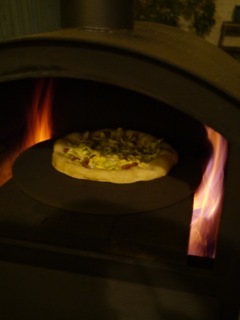 But we were also testing out a new method of making pizzas. 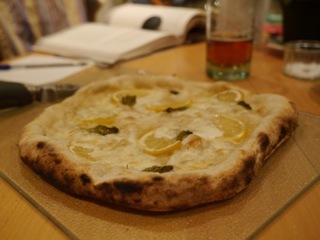 Something I hoped would achieve the charred edges but chewy interior which we'd been aiming for. That's what I was most excited about. That's what I'd like to talk through here. The technique itself I actually dreamt, yes, I now dream of pizzas - does that make me fluent?! 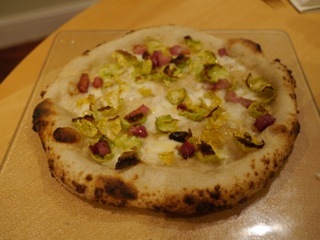 The idea being to cook the base quickly and achieve the rise and 'oven-spring' in the crust as it's placed on hot stone for 60-90s; at that point though, I would take the pizza off the stone on a metal peel and use the lower firebox section in Bertha to caramelise / carbonise - take your pick. That was the plan anyway. And for once, it was a plan which worked. As tasty as our previous efforts had been, they'd always looked a little anaemic. 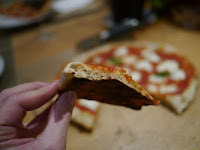 We'd brought them out early to avoid drying out the crust and burning the base, but in doing so, we'd missed the speckled charring or leopard spots which add so much flavour - a hallmark of greatness for the best pizzerias. The texture was amazing too, fluffy, chewy and just what we'd been aiming for. We were chuffed. I've love to go on about the flavour, to talk about the specific toppings, as these were three recipes I'd had my eye on for ages, although our sinuses had other plans. We both had stinking colds and as visually appealing as these all were, we couldn't taste a thing. What's the sensory equivalent of a rain check? We're going to have to make all of these once again. 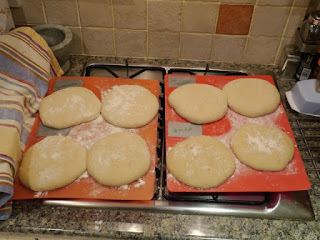 Saturday was D-Day, Dough-Day to be clear, we didn't venture to Normandy. 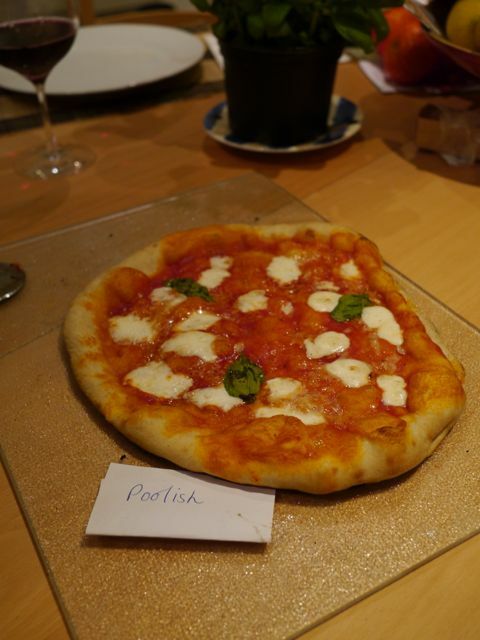 The aim was simple, to try a variety of dough recipes with a view to finding our favourite. 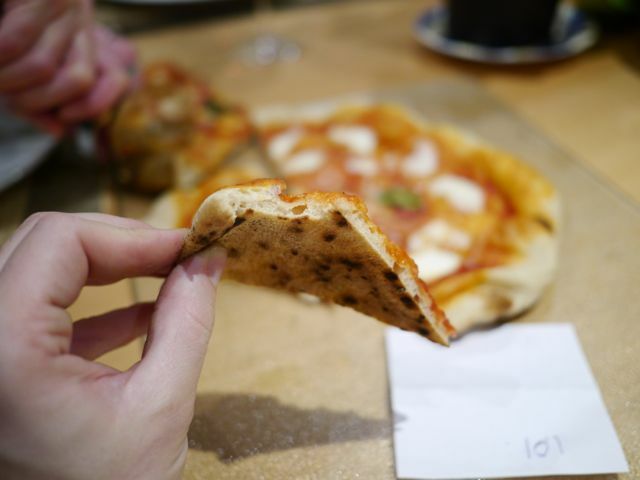 We were sticking to classic Neapolitan pizzas which happen to be both our personal favourites and notoriously difficult to perfect. 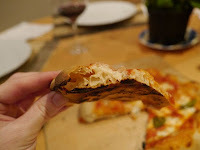 The dough has fewer ingredients typically than New York, or square pan Sicilian styles, but the higher temperatures required in cooking mean there's a fine line when aiming for a charred exterior but soft chewy cornicione - or crust to you and me. I'm an engineer by background and the geek in me took over as I insisted on minimising the variations between each pizza so we could be sure that all we were testing was the dough. 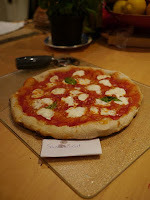 Each pizza was formed from the same flour (not Caputo Tippo 00, which I know I'd be marked down for in Naples, but Stoate's Organic Stoneground Strong White flour - I've got a 25kg sack of the stuff which I really should use up before ordering another). 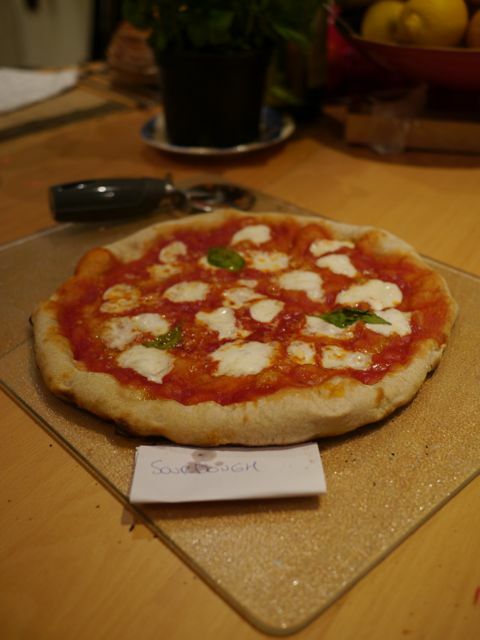 The same toppings were used, this was classic Neapolitan style so it had to be margheritas. 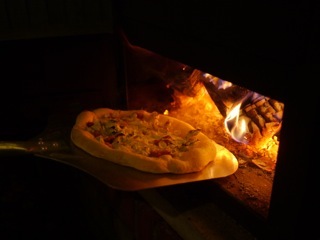 The oven was held at the same temperate, well, within the relms of what's possible on a small domestic wood fired oven. We heated Bertha so the temperature of the stone read ~300 °C with a flue temperature of 400 °C. 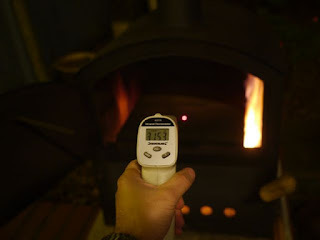 Ideally I'd have liked this higher as traditional Neapolitan ovens tend to run around 500 degrees, however there the heat source is from one side and they have a much more even distribution. In Bertha the fire is directly below the stones, so the bottom of the pizza tends to cook much quicker than the top. 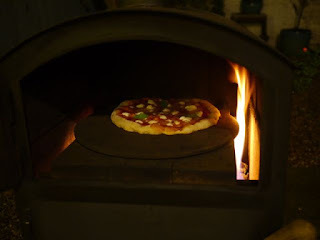 As a result, we ended up having to take them out early to avoid burning the base, which means the crusts lack the telltale leopard spot charring typical of Neapolitan pizzas, but you can't have everything… I'm already planning to experiment with the blowtorch to rectify this. 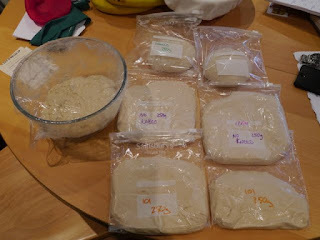 Anyway, back to the dough. 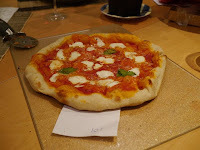 I ended up trying 4 variations, a sourdough recipe with a strong pedigree, as I believe it's used by Franco Manca, "The Best Pizza Dough Ever" recipe from 101 Cookbooks, which stems from acclaimed baker and author Peter Reinhart. We also tried a no knead recipe from the Slice pizza blog and finally another Peter Reinhart recipe (I'm a bit of a fan) from his Crust and Crumb book, which started with a pre-ferment, poolish or sponge, so was a bit different to the others. 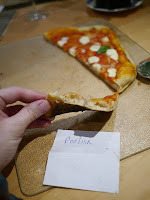 Four dough recipes - can't be that hard I thought. Error. 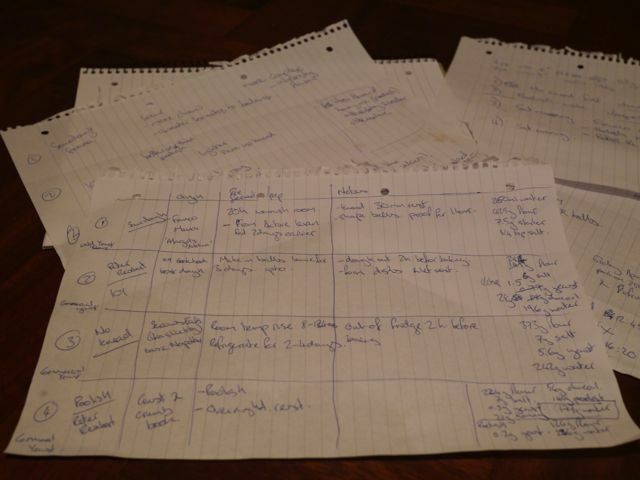 Each required several day's preparation along with an elaborate mixing and resting schedule, so out came the note book again. I didn't help myself by selecting mainly US recipes either, how many millilitres of water are in a cup… (well it turns out it depends on your cup, that'd be 236ml for a US one or 250 for a metric one - I worked on the assumption that they're patriotic about their cups in the US, so went with 236). As you can see from the ingredients column there was considerable faff to sort the ratios into manageable quantities, if we'd stuck to the original recipes we'd have ended up with enough dough for 32 pizzas, which even by our gluttonous standards seemed ambitious. 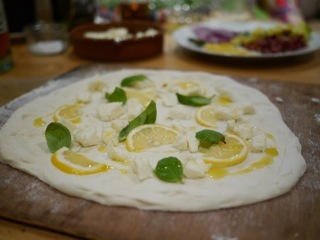 This way we had just over 500g of dough from each recipe so we could make two 250g pizzas. 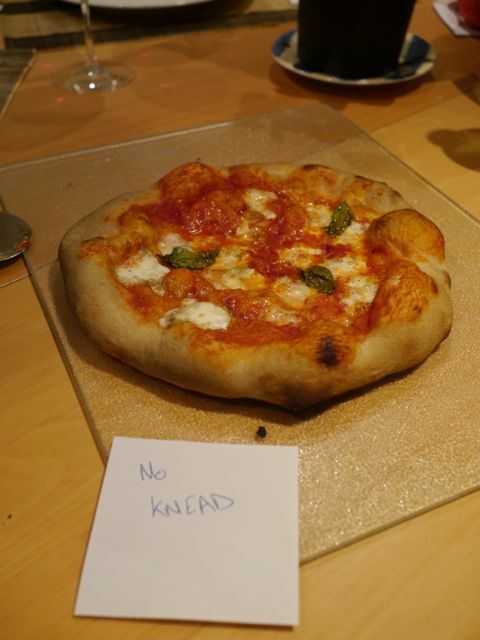 Our thoughts: Very light and airy, best rise, crust like fluffy white bread, not much flavour. Our thoughts: Sweet. Less rise, more 'crumb' texture. Tastes like potato cakes! More caramelised, could work well with blue cheeses and figs. 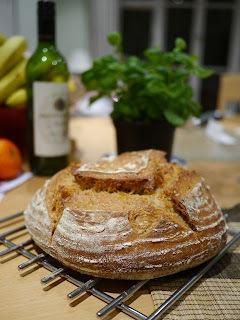 Our thoughts: Better rise than Poolish, lighter than No Knead, still little flavour. 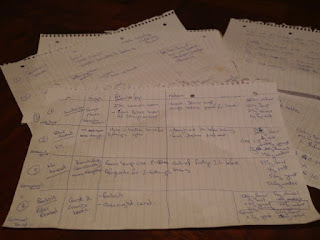 Our thoughts: More complex and substantial, interesting flavour. Sweeter tomato mixture would work well to balance the sour flavour from the dough. So there you have it, 4 different dough recipes with some surprisingly different results. 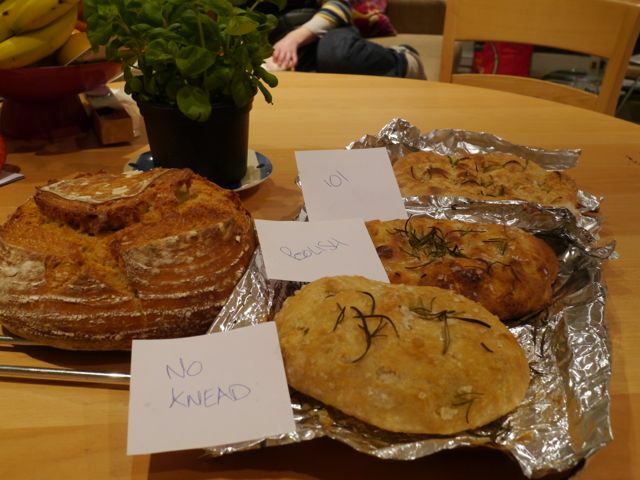 I don't believe you can say which is the best, that's too subjective, but what we can say is which was our favourite, and that was the sourdough by quite some margin. It had a far more interesting flavour and added more to the overall taste rather than being just a receptacle for the topping. 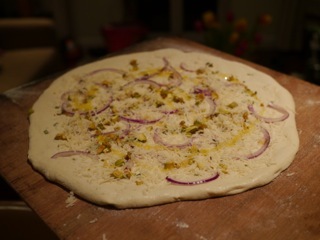 The dough was also one of the easiest to make too. Guess I shouldn't be too surprised that the recipe from the award winning Franco Manca came out on top, but we learned a lot along the way.